Garden fresh green beans are a staple for any pantry. When you can green, string, Italian, or wax beans, select beans that are tender and small. Remove the ends and strings from the beans. Can them whole or cut them into 1- to 2-inch pieces. Canning and preserving low-acid foods — such as green beans — requires pressure canning to kill microorganisms that are harmful if not destroyed before ingesting the food. Pressure canning at 240 degrees kills the botulism bacteria. If this temperature isn’t achieved and the bacteria isn’t destroyed, one taste of this spoiled food can kill you. Simply boiling food on the stovetop will not kill any botulism and should not be considered a safety step. 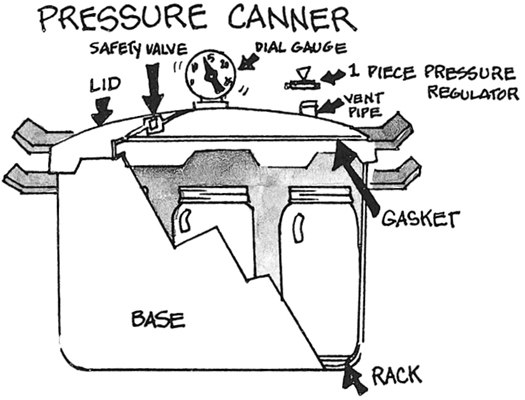 This is a great first recipe for the beginning pressure canner. Although this recipe specifically uses green beans, all colors of beans — green, yellow or purple — work equally well. Prepare your canning jars and two-piece caps (lids and screw bands) according to the manufacturer’s instructions. Keep the jars and lids hot. In an 8-quart pot, bring 2 quarts of water to a boil. While water is boiling, clean and cut the beans. Remove any dirt and shake off the excess water. Trim off the ends of the beans and cut them into 2-inch pieces. 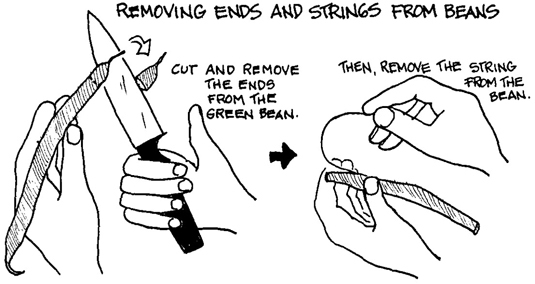 Removing the ends and strings from green beans. Tightly pack the cut beans into the prepared jars. Pour the boiling water over the beans, leaving 1-inch headspace. Add 1/2 teaspoon salt to each pint jar or 1 teaspoon salt to each quart jar. Release any air bubbles with a nonreactive utensil, adding more water as necessary to maintain the proper headspace. Wipe the jar rims; seal the jars with the two-piece caps, hand-tightening the bands. Process the filled jars in a pressure canner at 10 pounds pressure for 20 minutes (pints) or 25 minutes (quarts). Allow the pressure to return to 0, wait an additional 10 minutes, and then carefully open the canner lid. Use a pressure canner to safely process low-acid foods, including many vegetables. Prior to eating or tasting, boil the food for 15 minutes. For altitudes over 1,000 feet above sea level, extend the boiling period 1 minute for each increase of 1,000 feet. Per 1/2-cup serving: Calories 10 (From fat 1); Fat 0g (Saturated 0g); Cholesterol 0mg; Sodium 292mg; Carbohydrates 2g (Dietary fiber 1g); Protein 1g.